MooMama: Giveaway Ends at Midnight! 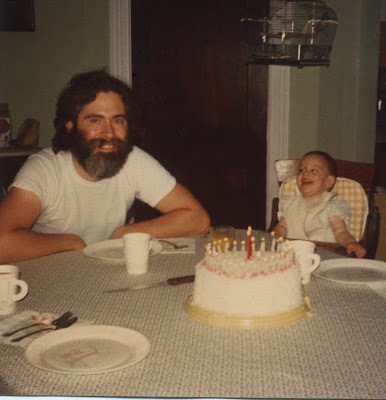 Yesterday, my Dad and I celebrated our birthdays together as we have every year for the past 34 years. I am happy that we share this day. I am glad to know he thinks the best birthday present he ever received was...me! Here we are my very first birthday! Holly Hobbie plates! Poor guy suffered so many years with girly plates. I love that glance I am giving him in the photo. Like he is just about the best Dad a girl could ever have! Actually, that sentiment still remains true. Then, today and forever. * Today is the last day (until midnight!) to enter to win one of TWO "Celebrate" felt banners! If you could create a new holiday with your most favorite of things to celebrate..what would it be? Click here to enter!